More than 150 photographs and related objects will be on display in the exhibition “More Than a Picture: Selections From the Photography Collection at the National Museum of African American History and Culture” opening May 5. This will be the first exhibition opening in the National Museum of African American History and Culture’s Special Exhibitions Gallery on the Concourse Level, which will be used to mount temporary, short-term exhibitions in addition to the museum’s permanent inaugural exhibitions. Complementing the museum’s popular series of photography books, Double Exposure, the exhibition encourages visitors to explore the ways photographs reflect important moments in history and memory and continue to shape the understanding of African American experiences. Positive Reflections October 16, 1995, Created by: Roderick Terry. Collection of the Smithsonian National Museum of African American History and Culture. The photography showcases a striking visual account of key historical events, cultural touchstones and private and communal moments to illuminate African American life. From the eras of slavery and Jim Crow to Black Lives Matter, “More Than a Picture” presents a range of American experiences that look beyond the surface to see the photographs’ significance to history and cultural meaning. “The power of photographs is not only the ability to depict events but to bring human scale to those experiences,” said Lonnie G. Bunch III, the museum’s director. “Images have the power to tell stories, create opportunities for engagement and inspire people to recall, act, change the course of history,” said Bunch. Red Green & Black, Chicago 1988, Photograph by: Walter Iooss Jr. Collection of the Smithsonian National Museum ofAfrican American History and Culture. Iconic portraits of Frederick Douglass, W.E.B. Du Bois, Queen Latifah and Grace Jones will be seen alongside historical and recognizable images from the civil rights movement, Hurricane Katrina and the initial uprisings in Ferguson and Baltimore. The exhibition features a selection of portraits of famous and unknown people who empowered themselves to redefine history; groups that shared bonds that defined their sense of community; and examples of personal expressions that also reflect culture and identity. The images are from the museum’s large and growing photography collection, an essential part of its holdings. From 19th-century daguerreotypes to contemporary digital prints, the museum’s photography collection of more than 25,000 images includes photographs as varied as studio portraits, art photography and family portraits as well as prints by notable photojournalists. In addition to images produced by world-renowned photographers, the collection also includes photography by lesser-known image makers who documented the contributions, struggles, triumphs and everyday lives of African Americans. Lewis "Big June" Marshall Carrying the U.S. 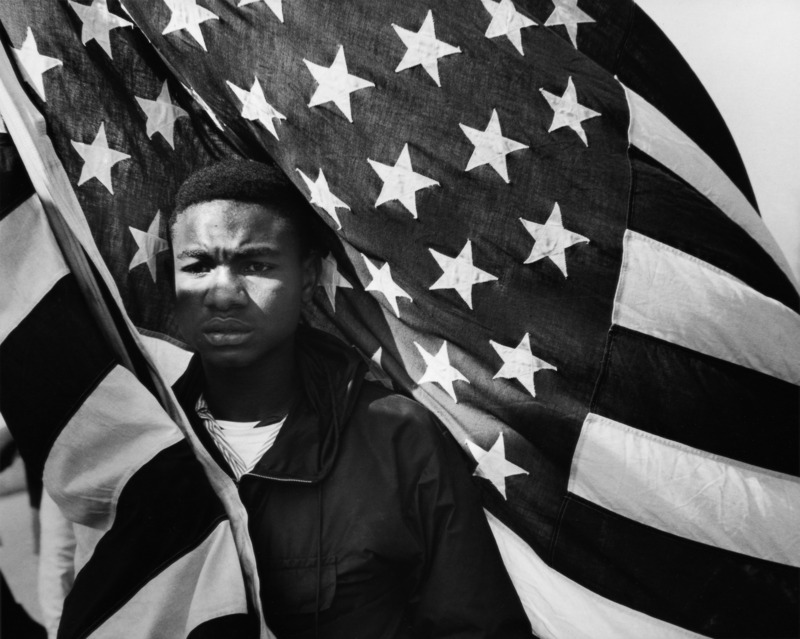 Flag, Selma to Montgomery March, March 21, 1965. Collection of the Smithsonian National Museum of African American History and Culture. The photography collection also supports the Earl and Amanda Stafford Center for African American Media Arts (CAAMA). CAAMA, a physical and virtual resource within the museum, encourages the preservation and interpretation of photography, film, video and other media, including oral histories and sound recordings by and about African Americans. This special exhibition includes works by established and emerging photographers ranging from the 19th century to the present, including Cornelius Battey, P.H. Polk, Ernest Withers, Ming Smith, Louis Draper, Wayne Miller, Sheila Pree Bright and Zun Lee. Other notable image makers include such photographers as John White, the two-time Pulitzer Prize-winning photojournalist; Camilo Vergara, recipient of the MacArthur Fellowship, Berlin Prize and National Humanities Medal; and Devin Allen, who recently received the Inaugural Gordon Parks Fellowship from the Gordon Parks Foundation. Untitled November 13, 2015, Photograph by: Devin Allen. Collection of the Smithsonian National Museum of African American History and Culture. “More Than a Picture: Selections From the Photography Collection at the National Museum of African American History and Culture” is curated by Aaron Bryant, museum curator of photography and visual culture, and Michèle Gates Moresi, supervisory museum curator of collections. The National Museum of African American History and Culture opened Sept. 24, 2016, on the National Mall in Washington, D.C. Occupying a prominent location next to the Washington Monument, the nearly 400,000-square-foot museum is the nation’s largest and most comprehensive cultural destination devoted exclusively to exploring, documenting and showcasing the African American story and its impact on American and world history. For more information about the museum, visit nmaahc.si.edu or call Smithsonian information at (202) 633-1000.